Adults have to eat too! Sometimes you need a quick and easy lunch, but you are tired of the same old thing. You think you might just go on a fast instead of eating another boring sandwich and chips. Here is an idea to help with that! This lunch gives you tons of flexibility on what to create with the ingredients. I am a firm believer that everything is more fun on a stick and this lunch is no exception. I made two vegetable kabobs with grape tomatoes and mini Persian cucumbers. The other kabob is alternating chicken and cheese. Now here is where this gets interesting. I filled one compartment with humus and the other with mini tortillas that I made. The tortillas were easy, I just used a glass on top of a regular flour tortilla to make perfect mini circles. This is what gives you the flexibility to make your own small pita pockets with chicken, cheese, vegetables, and hummus, or the other option is to just dip the tortillas in hummus and eat everything else on its own! I hope this helps take your own lunch to the next level. 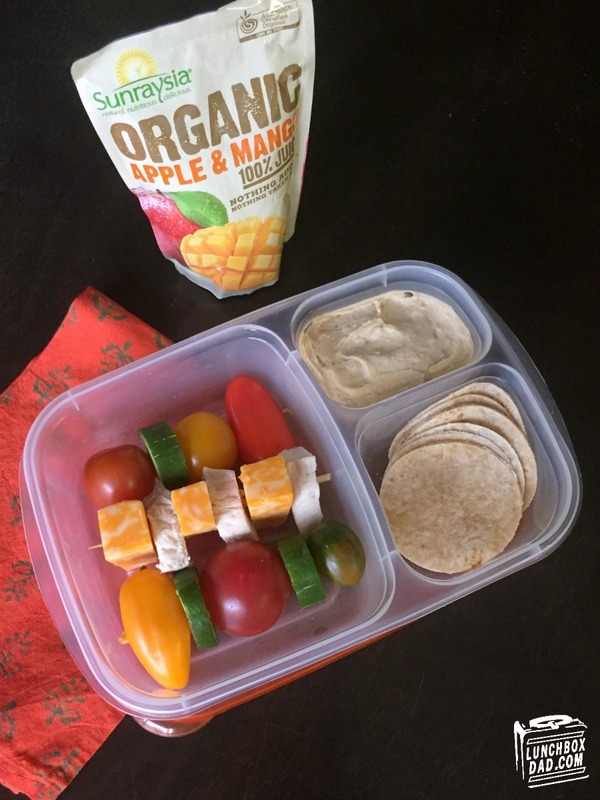 I packed it in an Easy Lunch Boxes container like I do with some of my kids' lunches. Have a great week and remember to follow me on all of my social media so you never miss out!